Thirty-seven horsepower in the 1,400-pound Tata Nano is fine. Over 200 horsepower is better. 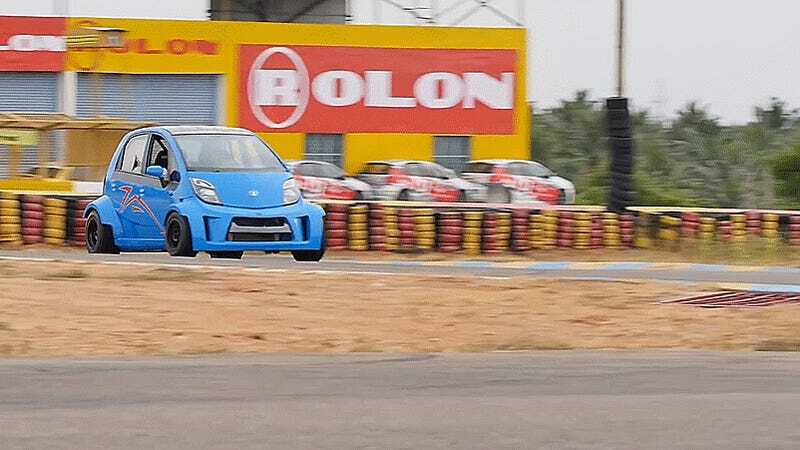 JA Motorsports’s Super Nano took a superbike motor and stuffed it into the rear of the cheapest car in the world to build what they called the “Super Nano.” It sports a tubular chassis that shares some parts with a Formula 3 car, and a wider stance than stock. That 200 hp superbike engine doesn’t have a ton of power at the low end, as it doesn’t start building power until around 6,000 RPM. Autocar India host Shapur Kotwal says it gets “completely insane” at 10,000 RPM, and tops out around 14,000 RPM. Even then, it’s a bit of a torqueless wonder. Even though it’s hard to keep the Super Nano in its powerband, this sounds like a blast. Jason Torchinsky described the Nano he drove as having thin, flimsy parts. To me, that sounds like it comes with added lightness. Clearly, it’s the perfect base for a track car.